Anodizing is an interesting field and it is an electrolytic passivation process to increase the thickness of the natural oxide layer. When aluminum is exposed to air it will form a natural oxide layer. It is the anodized oxide layer that can be colored with different dies after the anode cathode electrolytic passivation. This is my own understanding of the process used so let me know if I am wrong. Anodizing increase corrosion resistance and wear resistance. Victorinox has used handles of aluminum for over 40 year and to increase the quality of the handles they are anodized. Also the dividing layers of a SAK may be anodized depending on the application and functionality. Not all dividing layers are anodized. Some Swiss Army Knives has been exposed to elements and substances that have caused damage to the surface on the aluminum dividing layers. If a SAK get maintenance it will last for a very long time without any damages. On the picture you can see a side plate and a dividing layer made of aluminum from a rather hard used Victorinox 91mm knife. All the discoloration you can see on the surface is caused by scratching. This from sand or other materials that’s been in the mechanism. Some discoloration will probably always happen. The surface got no buildup of corrosion or other malformations and it is this that is important. Victorinox changed to aluminum dividing layers in 1951 this because of weight and excellent process ability. Galvanic corrosion or this is the term collectors and users use on the buildup of the surface on the dividing layers or side plates. This buildup is not good because it will affect the functionality of the SAK. The functions will not be possible to open depending on the extent of damage or buildup. If a SAK that is used get some maintenance and oil it will not happen. 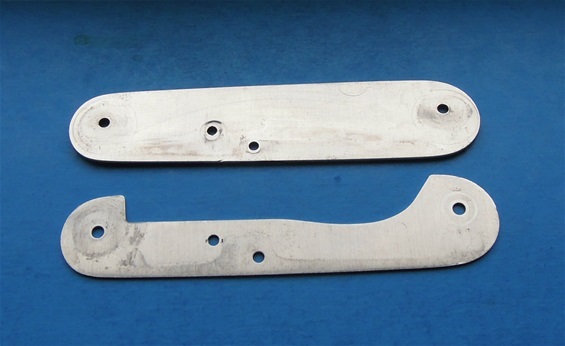 On the above picture you can see the sideplate of aluminum from the same knife thats seen rather hard use for many years.This sideplate is from the layer that hold the blades. The mainblade is the most used function and there is no negative to find at all. No buildup on the surface only some scratches and some discoloration. This knife has seen saltwater and salty air + soaps and more. From 1957 Victorinox has used aluminum handles on the 93mm category. From my understanding these are anodized and then colored. I have never seen any wrong on the surface on this category. Usually the dividers are made of brass or nickel-silver. Some special applications may be hard anodized and it is my understanding that the thickness of the layer can be increased further. There is different information to be found on the internet and I understand hard anodizing to increase the wear resistance of the surface or color. A thick anodized surface is porous and therefor one needs a sealing process. It was interesting to see on youtube that after coloring one need to boil and in this process one may use a special sealing compound. These are only my own research and how this Victorinox knife is hard anodized I do not know, there is some information on the internet on black anodizing processes or the types. It is my understanding that aluminum form a natural oxide layer and like we know it can with the help of anodizing further improve this ability. If one scratch the surface of an anodized part it will get a slightly different or matt aluminium surface again and become vulnerable. When color anodizing under current one may color the aluminium oxidized layer. Another interesting part is the use of the anodizing to stop further oxidation/changes and when this is scratched by sand or other dirt it may become vulnerable. In the 100 year book the knife and its history there is a short but good information on the two anodizing plants. This was in 1984 and it is mentioned about the dividers and scales that are anodized. Aluminum scales are anodized before being printed and coloured and then dipped in a sealing bath to plug the pores. The silver Alox gives much value for the money.